Charlie Hebdo support at the Globes Jump to media player Celebrities attending the Golden Globes awards ceremony in Beverly Hills have shown their support for the people of France in the wake of a deadly attack on the French satirical magazine Charlie Hebdo. Clips of Golden Globe-nominated films Jump to media player Birdman leads Golden Globes nominations including the best comedy or musical film. Golden Globes start awards season Jump to media player The awards season gets under way in Hollywood on Sunday - with the Golden Globes ceremony recognising the best work in the TV and film industry in the last year. US sanctions North Korea over Sony Jump to media player The US has imposed new sanctions on North Korea in response to a cyber-attack against Sony Pictures Entertainment. Grand Budapest Hotel leads Baftas Jump to media player The Grand Budapest Hotel, an offbeat comedy starring Ralph Fiennes, leads the way with 11 nominations for this years Baftas. Celebrities attending the Golden Globes awards ceremony in Beverly Hills have shown their support for the people of France in the wake of a deadly attack on the French satirical magazine Charlie Hebdo. 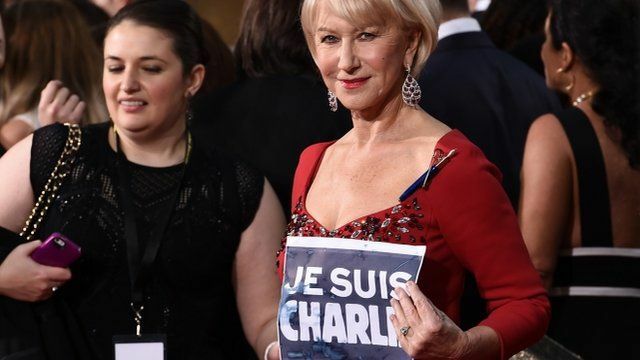 Dame Helen Mirren and George Clooney were among those who displayed the words "Je suis Charlie" on banners and badges on the red carpet. You can follow the BBC's live coverage throughout the ceremony here and on the @BBCNewsEnts twitter account.